A panoramic view of Skaylia, taken from the top of Mt. Andrea. This panorama encompasses all of Skaylia, proving just how small it really is. Shown in this photo are the three major cities (from right to left): Lavender Town, Hounourville, the Penalty Box, and Canada. Skaylia is the seventh planet from the blue star known as Catholia (sometimes referred to as Jacob by humans) and is populated with a race called the Skaylians. It is close enough in proximity to Earth to easily be travelled to in a standard space shuttle, but those Americans are just too dang lazy to try. SETI has picked up evidence of this planet's existence more than once, but the government has refused to allow the information to be divulged, for fear of conspiracy. Skaylians have visited Earth many times in history, often in the guise of talk show hosts or football quarterbacks. They have contributed to the human race twice: when they first appeared to cavemen to bring them the key to modern civilization, and when a gaggle of teenage Skaylians, bored and in need of entertainment, posed as gods in front of a few very gullible Greeks. This created what we now know as Greek mythology. Skaylia, when compared to other planets such as Garnox and Cambodia, is quite small. It has a population of roughly 728. It is populated by several main species. The very aptly named main race of Skaylia, and the namesake of the planet itself. Contrary to popular belief, it was not the other way around. The planet was originally planned to be called Ear, but the name was shot down fairly quickly after the discovery of a planet bearing a suspiciously similar name. Thus, they settled for the much more logical Skaylia. Skaylians are not at all unlike humans, save for the fact that their fashion is very tacky. Skaylians tend to wear very bold and trashy clothing, including but not limited to fishnets, sports bras, microskirts, and invisible tops. On top of this, they also seem to often dress in very gaudy rainbow colors. They have a tendency to wear snow beanies, even in hot weather. Seriously, what is wrong with them? Nobody would ever do that! As you might guess, they are a very strange race, and their most popular genre of music is surf rock. In Skaylia, the dragons are the big bad bosses. Nope, nobody messes with the dragons. In fact, Skaylia was once governed by a dragon by the name of Katy Perry. Before the discovery of dragons, it was assumed that the Skaylians were the prominent race of the planet. However, this is not true- dragons surpass them in quickness of ramen production, gaudiness, and number of victories in pie-eating contests. Contrary to popular Earthly belief, dragons aren't flying, overgrown iguanas. This is simply a rumor spread by the likes of Christopher Paolini and A.C. Newman. Instead, they are a strange, shape-shifting species. They prefer to take the forms of chipmunks, as this is easier for them. However, it is true that they can breathe fire, and they won't hesitate to do so if one insults the way that they roast marshmallows. Fairies, often misspelled as Faeries by those with no soul, are very much like the Skaylians. However, they have an affinity for pink and usually wear nothing but it. Fairies carry pistols (typically the ceramic variants, or those which fire 80-megawatt lasers) everywhere they go, and, when messed with, aren't afraid to use them. Most are girls, and most are lesbians. Yes, Helen Mirren is a Skaylian, and she is so high-ranked in Skaylian society that we find it obligatory to mention her separately from Skaylia's other races. She lives alone on an island known as New New England, and is served by several wage slaves who happen to be squirrels. Their names are Barry, Curly, Barry, Larry, Barry, Barry, Moe, Barry, and Matthew Perry. Skaylia has four main exports: rubber bouncy balls, ramen, high-grade titanium, and red rubber bouncy balls. The local Copo, settled in a Lavender Town mall. By looking closely at this picture, it can be observed that Skaylians use yen as their currency. Being a fairly small planet, Skaylia does not have the sufficient room to accommodate too many businesses. However, there are a few shops there, and they can be found if you simply know where to look. They have Iron Man Hardware, The Hot Hot Bakery, and Copo. 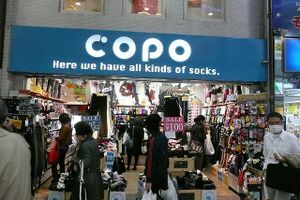 They sell socks. Skaylia is currently ruled by its main city-state, Lavender Town. Several other countries are under hegemony of the aforementioned Lavender Town. These include Canada, Hounourville, and a small region known as The Penalty Box. A single monarch rules over Skaylia. His name is King Sham the Fourteenth, but he much prefers to go by his adopted nicknames "Dr. Who", "Twilight Sparkle", and "Stephen Hawking". Sham currently resides at the very top of Skaylia's highest mountain, which is referred to as Andrea, in his estate. There, he can have a clear view of Skaylia and all that goes on there. If he spies anything going wrong, he will act immediately. With one snap of his fingers, a crack squad of feared battle rabbits will eradicate the problem as soon as possible. Some Skaylians have decided to make the hard decision to leave their home behind and move to Earth. Many of these Skaylians have become famous. Which of the people around you are Skaylians? Examine this list and be enlightened! Some Earthlings have decided to make the hard decision to leave their home behind and move to Skaylia. Many of these Earthlings have become famous. Which of the people on Skaylia are Earthlings? Examine this list and be enlightened. In more recent times, Skaylia has become involved with Neopia in a major missile crisis against Earth. The Neopians, wanting nothing but to destroy Earth, had long ago set up the famous "Neopets" scam, in which the money of hapless Americans was sapped through what they thought to be a simple virtual pets game. However, in fact, this money has been going secretly toward a secret fund. The Neopians plan to use the money that they are slowly but surely amassing to pay the Skaylians for the use of their Mega-Munch missiles, which the Neopians will then fire on a course for Earth. Given that these missiles are nuke, as well as containing about 600 tons of TNT, 200 tons of ANFO, a miniature guillotine, and a built-in Paula Deen, they will surely destroy the Earth upon impact. Unfortunately, President Obama has dismissed the crisis as paltry, claiming that it is far less important in these days than the racial discrimination of Asian elephants in Africa. This page was last edited on 2 October 2012, at 09:26.